From left, rear: Ben Shuffain, CHS boys’ varsity baseball coach; Dr. Craig M. Allen, CHS Athletic Booster Club president; Danny Erickson, CHS athletic director; Brett Burbank, Canton Little League director; Mike Loughran, Canton Little League treasurer; Derek Folan, CHS principal; Dr. Jennifer Fischer-Mueller, Canton Public Schools superintendent; David Scarcella, Bank of Canton branch manager; Stephen P. Costello, Bank of Canton president & CEO; Barry Nectow, CPS school business administrator. They were joined by members of the CHS varsity boys’ baseball team prior to the team’s opening day game against Duxbury. CANTON, Mass. 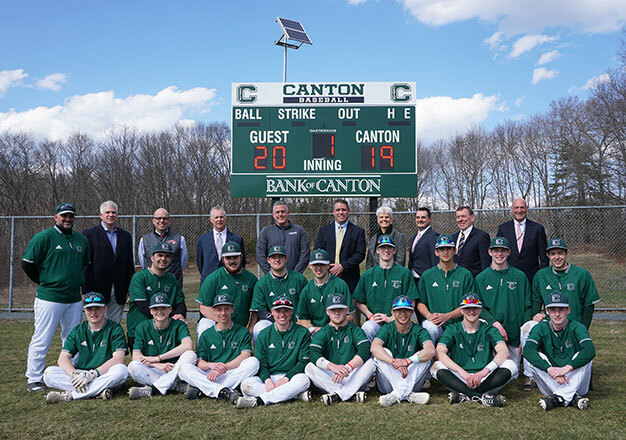 (April 4, 2019) – Community representatives who helped fund the new scoreboard at Canton High School’s Gibson Field were joined by school officials and members of the CHS varsity boys’ baseball team on opening day to celebrate the scoreboard’s installation. The state-of-the-art scoreboard is powered entirely by solar energy. Bank of Canton, the CHS Athletic Booster Club, and Canton Little League split the cost of the $15,240 scoreboard equally, with each group contributing approximately $5,000. “Our Bulldog student athletes are fortunate to live in this supportive community,” said Danny Erickson, athletic director at Canton High School. “So many local businesses get involved in so many ways. This scoreboard is a great example; it’s not the first time Bank of Canton has financially supported the purchase of a scoreboard for our kids. We’re lucky to have them as industry leaders in Canton. The Gibson Field scoreboard will be used by the high school and little league, as well as other local baseball groups. Since 2005, Bank of Canton has given more than $2.1 million to local charities and nonprofit organizations through donations and sponsorships. The bank’s contributions have helped fund financial literacy programs for children and seniors, educational workshops for first-time home buyers, and cultural and artistic enrichment programs. Established in 1835, Bank of Canton is a Massachusetts-chartered mutual savings bank that offers its consumer, business and government banking customers access to a full array of deposit, loan, investment and convenience service options. As a mutual savings bank, the bank has no stockholders and acts exclusively in the best interests of its customers and communities. The bank lends throughout Massachusetts, and has branches in Canton, Quincy and Randolph and a mortgage center in Auburn. All deposits are fully insured between the Federal Deposit Insurance Corporation (FDIC) and the Depositors Insurance Fund (DIF). For more information, visit www.ibankcanton.com. Member FDIC. Member DIF. Equal Housing Lender. NMLS #408169. Event is open to the public. Light refreshments will be served. To RSVP, call the Canton Council on Aging at 781-828-1323 or click/tap the button to RSVP via email. Event is open to the public, and lunch will be provided to those who RSVP. Call 781-830-6152 or email Peter Fredericksen with questions. B.O.C. Life Solutions is a licensed subsidiary of Bank of Canton. Bank of Canton does not provide legal or tax advice; consult your legal/tax advisor.